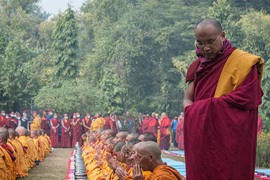 Students at Nalanda have an extraordinary devotion toward the Buddha and his teachings since it is based on a thorough knowledge and understanding of the Buddhist path. 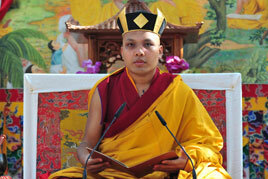 With this attitude, they study the precious teachings of the sutras, tantras, and Buddhist sciences. 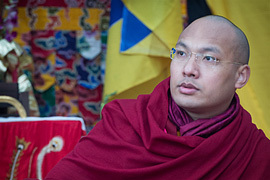 His Holiness the Sixteenth Karmapa envisioned tulkus and monks studying at the institute and joining in the great task of carrying the banner of the accomplishment lineage to all corners of the earth for the benefit of all sentient beings. Applicants study hard to prepare for the required entrance examination conducted by Sampuranand Sanskrit University. Though most pass, anyone who fails may continue to prepare for an additional year and try again. There is no difficulty finding qualified candidates for the school, with 125 having already applied, but there is difficulty finding sponsors for the students who have enrolled. 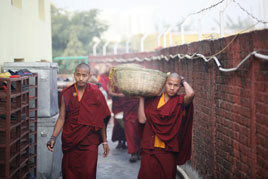 Tibetan refugees and students from India, Nepal, and Bhutan form the majority of the current student body. 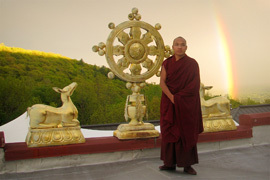 Most students cannot pay any of the costs associated with their education, and the shedra provides free education, textbooks, food, and lodging for qualified applicants who wish to pursue monastic study there. 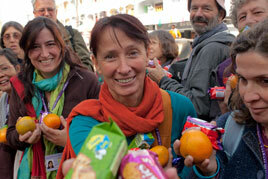 The institute receives financial support from individual donations which makes it possible to offer this assistance. 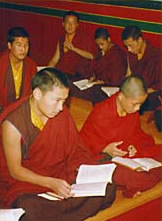 In 1982, through the efforts of KSNI teachers and with the permission of His Eminence Jamgon Kongtrul Rinpoche, the Students' Welfare Committee was founded. 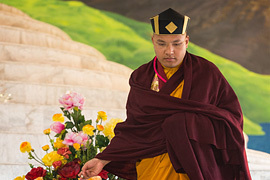 Its main aim is to provide help, support, and medical assistance for poor and sick students, and to arrange religious ceremonies and special programs commemorating the four great occasions of the Tibetan Buddhist calendar at the institute. 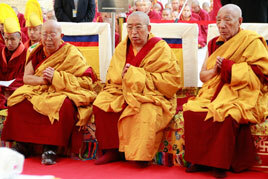 Committee members are appointed by His Eminence Gyaltsab Rinpoche. Students must have an eighth-grade level or equivalent education for admission to the shedra. Once admitted, they are required to take a two-year preliminary course of study before they can enroll in the university-level courses. 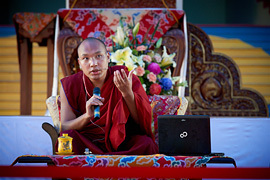 Students begin in the shetrig class, the first preparatory course which takes its name from the text on shetrig philosophy composed by Nagarjuna, and then progress to the khenjug class, named for a Tibetan philosophy text composed by Mipham Rinpoche. 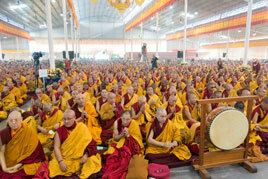 After enrolling in the institute and completing seven years of university courses in the full shedra program, students are awarded the shastri degree, equivalent to a bachelor's degree, and after two more years, the acharya degree, the master's degree in Buddhist studies, is conferred by Sampuranand Sanskrit University. 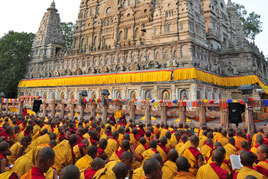 Karma Shri Nalanda Institute also simultaneously confers the ka-rabjampa degree (master of Buddhist sutras). 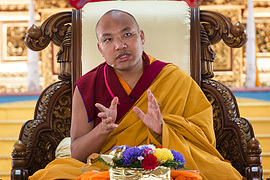 Students then teach for three years at the shedra, and specialize in one school of philosophy from among the five major philosophies of the Kagyu lineage before they can take the test for the khenpo designation. 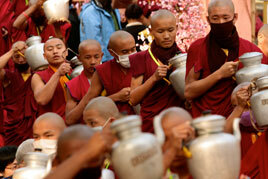 Once they graduate as a khenpo, most return to serve at their original monasteries. The fundamental training at the institute is based on a rigorous, traditional course of study with some influence from modern educational systems. 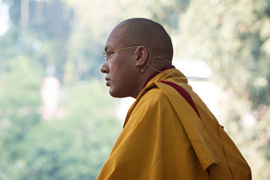 A variety of Buddhist philosophy and psychology courses compose the required curriculum at KSNI. 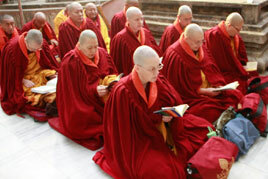 Elective courses include Tibetan grammar and literature, Sanskrit, a choice of either English or Hindi, base logic, and a choice of Buddhist history, art, Tibetan medicine, astrology, or Pali. 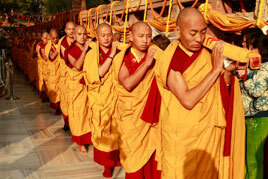 In addition to their academic pursuits, students also engage in various meditation practices. 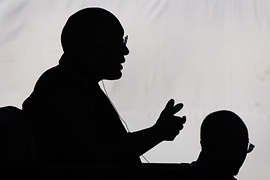 In the first two years philosophy students study the Vinaya, the code of behavior derived from the words of the Buddha describing the conduct of a nun or monk. 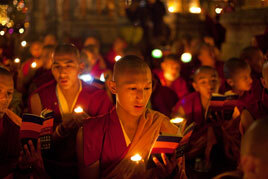 This series of rules was created by the Buddha to guide the monastic community toward illumination. During the third and fourth year, the philosophy teachings focus on the abhidharma, the body of the Buddha's teachings described as Buddhist psychology, metaphysics, or cosmogonies. 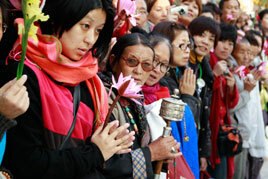 The abhidharma has also been called the teachings which describe the nature of the mind. In the fifth and sixth year, students study the sutras on Prajnaparamita, the perfection of profound cognition used to discover one's innate wisdom. In addition, from the fifth through the eighth year, the program includes part of Pramanavartikka, a text on Buddhist logic by the eminent Indian logician Dharmakirti, that prepares the students for formal debating. 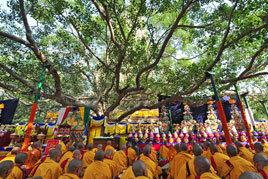 After the first six years, students no longer study Sanskrit or Tibetan grammar, and their seventh year is focused solely on philosophy, Buddhist history, and logic with the study of Madhyamaka, the Bodhisattvacaryavatara, a classic text on the bodhisattva ideals of Mahayana Buddhism by the eighth century scholar Shantideva, and parts of Pramanavartikka. At this point, students take a comprehensive exam and if they pass, they no longer study the entire elective course. 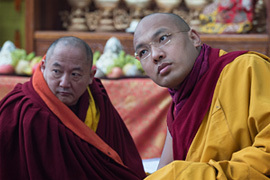 The senior class, those who have already earned their acharya degrees, is concerned solely with philosophy and logic, which they study for two years, focusing on aspects of Madhyamaka and the Bodhisattvacaryavatara. The Pramanavartikka is completed in the eighth year. 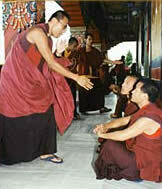 Students also study The Sixty Reasonings of Emptiness by Nagarjuna. 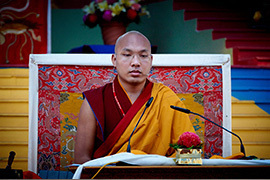 In the final year, students continue with Madhyamaka and also study three texts written by the Third Karmapa, Ranjung Dorje: Buddha Nature, with commentary by the Eighth Situpa, Chokyi Jungne; Distinguishing between Consciousness and Wisdom with commentary by Situpa Chokyi Jungne; and the Aspiration Prayer of Mahamudra with commentary by Jamgon Kongtrul Lodro Thaye. Students begin their day at five o'clock in the morning when they gather in the main temple of the institute to chant the Manjushri prayer to sharpen their wisdom. After self-study, chores, and breakfast, the morning classes start at 8:00. The first session finishes at noon for the lunch break; the second session starts at 1:00 p.m. and ends at 4:00, with tea at 3:30. The third session, when all students practice traditional individual debate, starts at 4:00 and finishes at 6:00, when dinner begins. 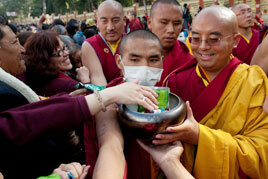 At 7:00 the students gather for Mahakala puja for one hour, and then return to their rooms to study from 8:00 to 10:00.